In daytime television many actors are treated as if they were expendable and replaceable. Soaps love recasting characters for one reason or another. Sometimes the actor just isn’t right for the role and other times they need (or are forced) to move on, leaving a hole in the fabric of the show. There are some characters that in theory, really shouldn’t ever be recast. 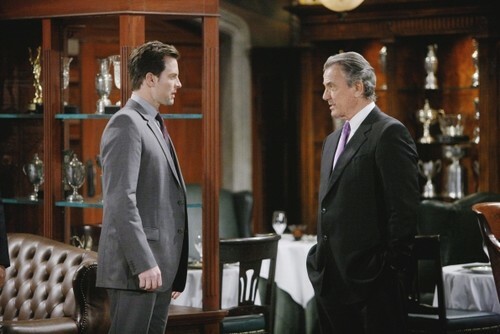 Is The Young and the Restless’ Adam Newman one of them? Well apparently Jill Farren Phelps, the executive producer doesn’t believe so. We recently told you that Jill has been actively looking for a replacement for Michael Muhney since last October. The actor wasn’t actually fired for alleged sexual harassment until December but the powers-that-be knew of accusations for months before taking any kind of action. Fans clearly don’t want to see anyone other than Muhney portraying Adam but the show is hell bent on bringing him back in the form of another actor. So much so that even Muhney new as he was being fired that the role was going to be recast. The question is who will have big enough feet to even attempt to fill Muhney’s shoes? According to sources connected to the show Jill isn’t just looking for a great actor but also one with precious little ego and minimal arrogance. That’s kind of funny isn’t it? An actor without an ego? Jill might be more likely to find a unicorn first! If she some how finds her version of Mr. Right to portray Adam then she still has to cross her fingers and hope that the fans are accepting of her choice. Actually, I don’t think that Jill cares very much what the fans think, do you? Tell us your thoughts about an Adam recast in the comments below!